The Boat House is a very large home featuring; two large living areas, five large bedrooms (sleeps 10), 2 large bathrooms and a fabulous undercover deck with great views over Lake Victoria and the Marina. Two bathrooms & 2 separate toilets. Bathroom 1 (Upstairs) is very large and features a large corner bath, shower and vanity (hairdryer is provided). Bathroom 2 (downstairs) is also very large and features a shower and vanity. The laundry is downstairs with a washing machine, iron and ironing board. The downstairs living area has a TV & DVD player, with a sliding glass door leading onto the downstairs deck with lovely views of the Marina across the road. Both living areas have reverse cycle heating and cooling. The dining room has an large extendable table that seats 10 people. The modern kitchen has a new gas stove, new Bosch dishwasher, microwave, fridge, coffee maker and an extensive range of dining and cooking equipment. A second full size fridge is located downstairs. The upstairs undercover deck area is large and features 2 hammocks, BBQ with wok, outdoor furniture and sun lounges. The deck is secure with a gate leading into the fenced backyard - perfect for the safety of pets or young children. A porta cot and highchair is available. To ensure your holiday is fun we have also provided a large range of books, DVDs, Video's, children's toys and board games. Various kitchen products are provided including - tea, coffee, sugar, salt, pepper, cling wrap, foil, dishwashing tablets, dishwashing liquid, tissues and toilet paper. All bed linen is provided including sheets, pillowcases and doona covers. Tea towels and bathmats are also provided. You are required to provide towels and beach towels. The Boat House is pet friendly featuring a fully fenced backyard and a secure deck with gate. Responsibilities and the number of pets are to be discussed with the owner when booking your stay. It is the tenant's responsibility to clean up after your pet; including vacuuming dog hair and removing dog excretement. Dogs are not permitted on the furniture or beds. Smoking is strictly prohibited inside the house. An ashtray is provided on the deck. There is a large carport and ample off the street parking for both cars and boats. Minimum booking is for 2 nights. Prefer bookings of 7 days or more for Christmas holiday period. Bookings of 3 days for long weekends & 4 days for Easter. Departing - Basic Cleaning is the responsibility of the tenant unless otherwise arranged. Basic cleaning products are supplied for the tenants use. For large family holidays requiring two houses The Boat House is located beside Villa Marina. 5 minutes drive to 90 mile beach. An additional cost is charged if guests require towels. Very spacious and fantastic location across the road from marina which was handy to berth the boat overnight and 1 minute walk to bistro. 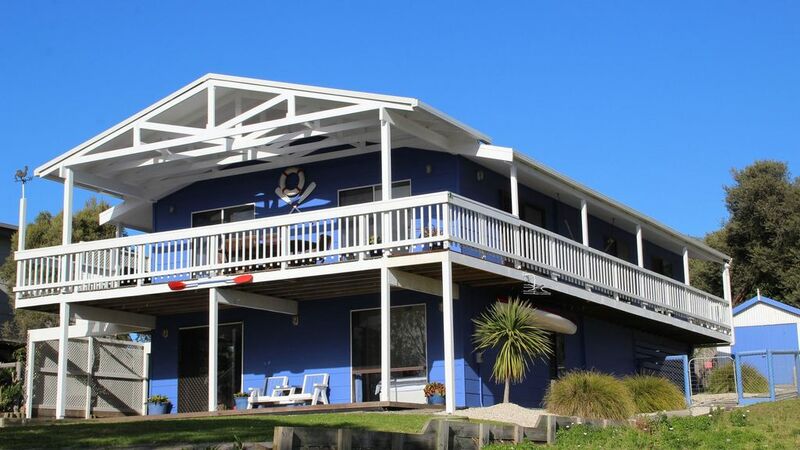 The Boat House is very spacious , clean and comfortable and well equipt with all you need to have a great break away. It's situated in a perfect spot overlooking the marina and I definately would recommend it as a great place to stay with family or friends. This is a beautiful boat house, overlooking the marina and the waters of Lake Victoria. It has comfy beds, a sunny deck and hammocks to relax in. There's lots of space to unwind and it's an easy stroll into the township for coffee.